Third in my series of book reviews - I should tell you that I was given the books in return for reviews, but there was no compulsion to be "nice", these are my genuine opinions. I was pleased to be sent this particular book "Beautiful Botanical Knits" by Nora J. Bellows because I used to knit flowers myself and was keen to see how mine compared. 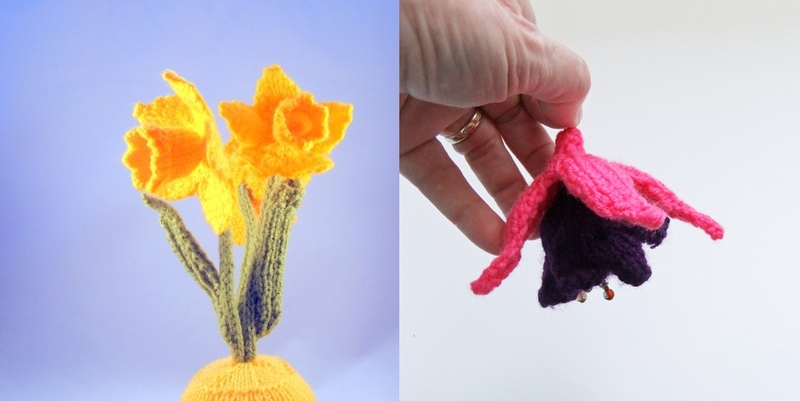 I knitted daffodils, tulips, poinsettia, bluebells and primroses. This week I found a fuchsia lurking in a stock drawer so that has just been relisted on folksy! Although I still like my own designs, Nora's are a cut above. 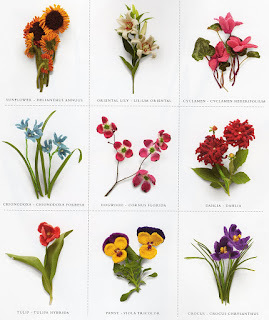 She has clearly observed the flowers very carefully and tries to include as much of the anatomical detail as is possible. I'm pleased to say we both start knitting the same way: "I want you to get down and peer into the throat of a single foxglove flower - and to wonder how to knit it." Nora shares patterns for 40 different flowers and shows each flower both knitted and then felted. It is not "compulsory" to felt them, in fact I think some look better without. 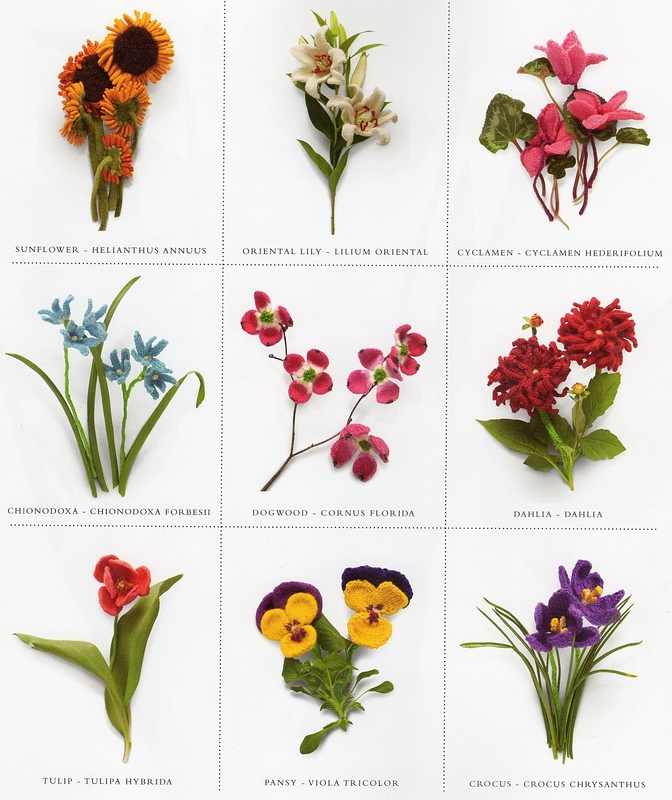 Some flowers are wired, some are embellished with beads - it's all down to your preference. As is generally the case, the patterns are for personal use only and the finished articles are not licensed for sale. The knitted flowers are cunningly photographed on natural stems and leaves, it's quite hard at first glance to see where nature stops and knitting takes over! 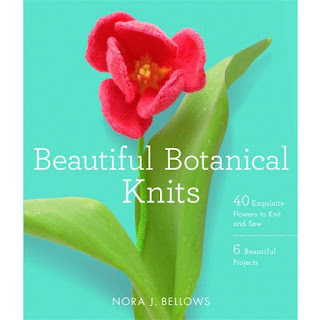 What I really liked about this book is that Nora doesn't "just" show us how to knit flowers, she also suggests uses for them. As I discovered myself, there are only so many knitted flowers in pots that can be accommodated! Isn't this fuchsia wrap stunning? The book contains patterns for flower embellished projects: bags, shawls, gloves, cushions and Nora encourages us to be creative in our use of these patterns: "Change the scale of the "scarf" and it becomes a wreath of violets, a necklace of lesser celandine, the cherry blossom headdress of a little girl, or a jasmine wedding garland for a bride." 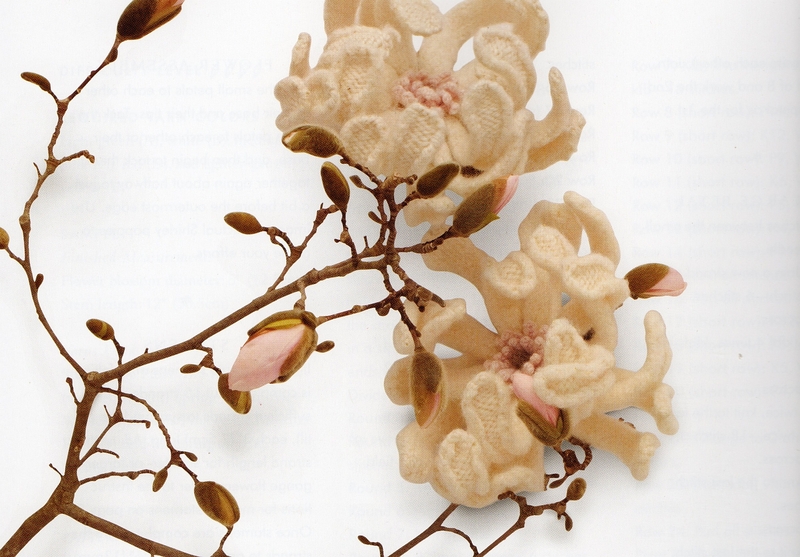 To conclude - if you have a hankering to knit flowers, I recommend this book. The patterns are graded for difficulty and there are clear photos of the various stitches and techniques you'll need. Like my own knitted flowers - they don't cause hay fever! I bought this book online and although it is useful, every pattern is knitted in the round, which is not everyone's cup of tea. The terminology used is American which might not be so familiar to knitters in Europe or, like me, in the South Pacific. Nor are the flowers well known ones internationally in every case, but you can of course adapt them to something similar from your own country. Thanks Dale, that's a useful addition to my review. Knitting in the round is my preferred method, but as you rightly say, not everyone's! We're on the BBC news website today! Meerkat Biker Leathers Design Assistance Please!